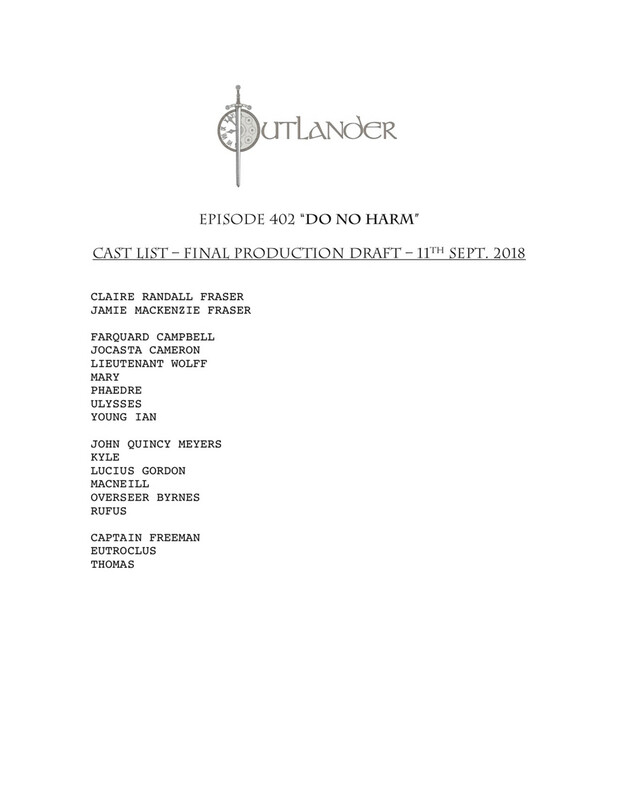 The title, “Do No Harm,” was chosen as its part of the Hippocratic Oath, and something that we’ve seen Claire invoke before. In Season 3, she tried to save a man who had attacked her, and in this story she is put in a situation of a physician’s greatest dilemma—do I save someone even if it means they will suffer a worse fate? Jocasta Cameron is a favorite character in the books, and the writers were excited to finally introduce her into the series. 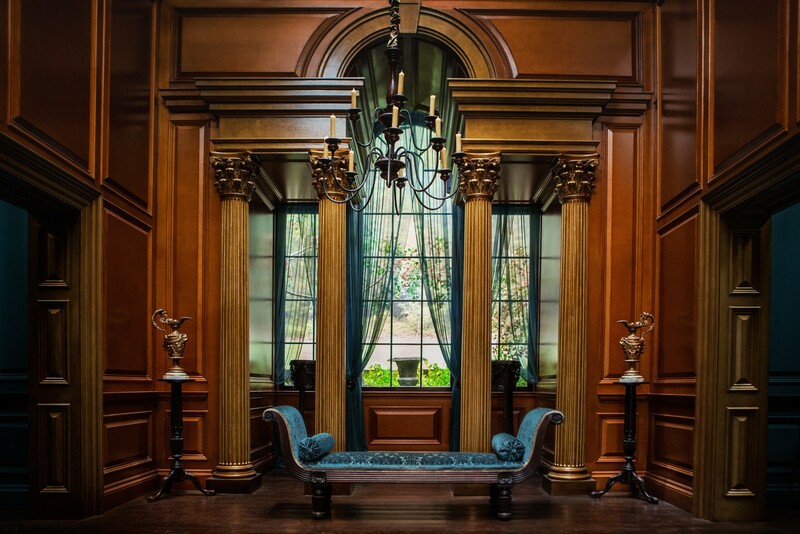 We chose to meet Jocasta at the dock of her magnificent home. She is introduced in all her glory and with the power of River Run in the background. 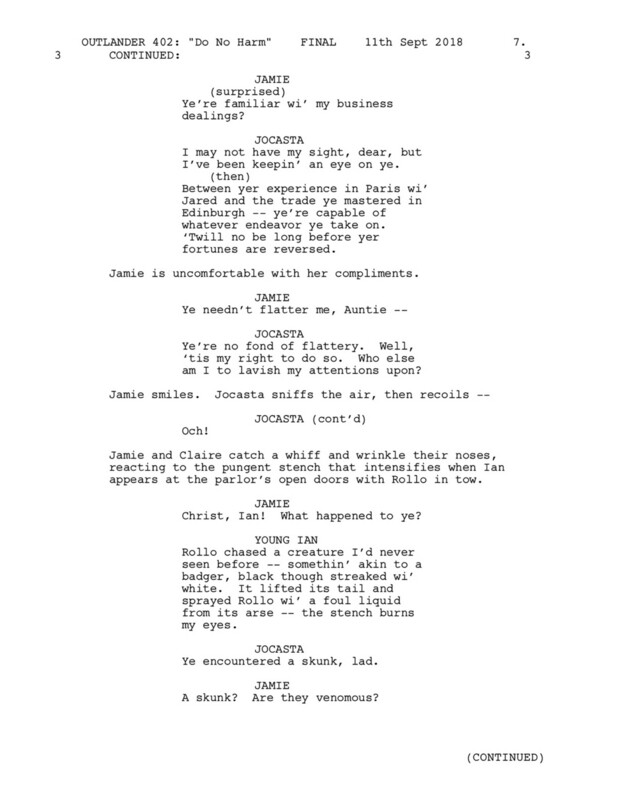 Jocasta is an elegant woman and looms large in Jamie’s life. She reminds him of his mother who he lost when he was young. We don’t immediately realize Jocasta is blind. 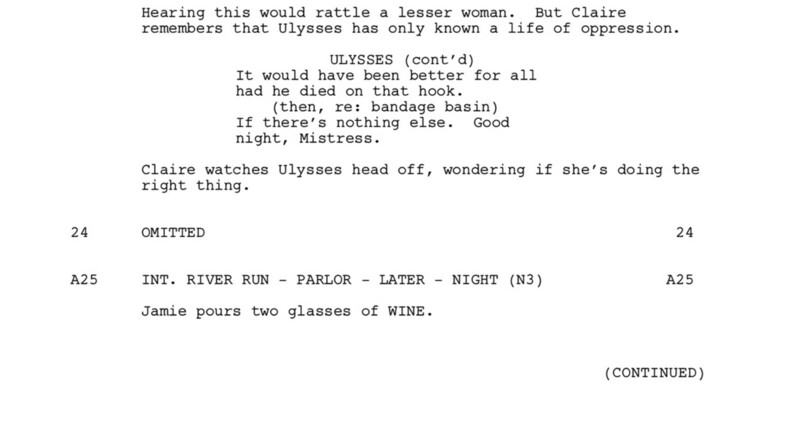 Only when Ian offers her flowers do we see that Ulysses must guide her, and we realize this powerful woman has a physical challenge. However, it’s apparent she has taken her loss of eyesight in stride and doesn’t let it hinder her in any way. 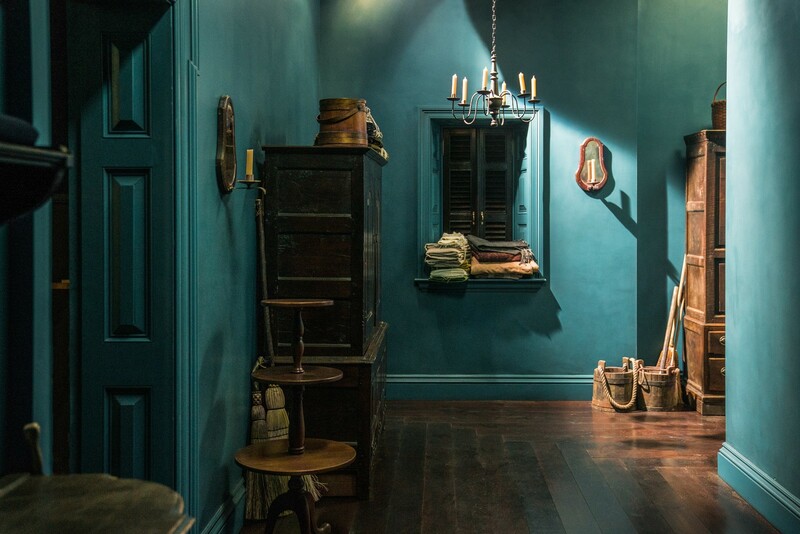 We wanted a moment of joy at River Run for Jamie and Claire’s arrival before the mood starts to turn, as the realities of plantation life soon start to affect them, especially Claire who is from the future. 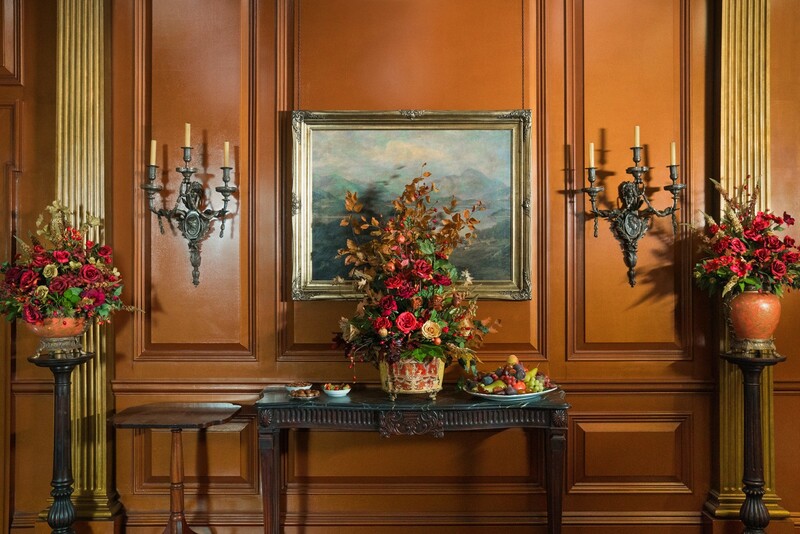 While Jocasta is overjoyed at the arrival of family, Claire is starting to feel the opposite. Being a modern woman, Claire is greatly disturbed by the presence of slaves and is not comfortable in this environment. 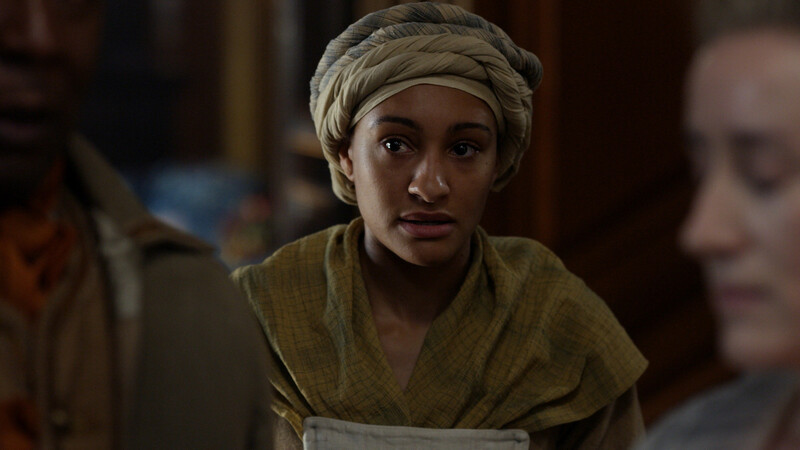 Claire encountered the reality of slaves in Jamaica last season. It disturbed her so greatly that she helped free Temeraire, her small part in righting something she knows is wrong. 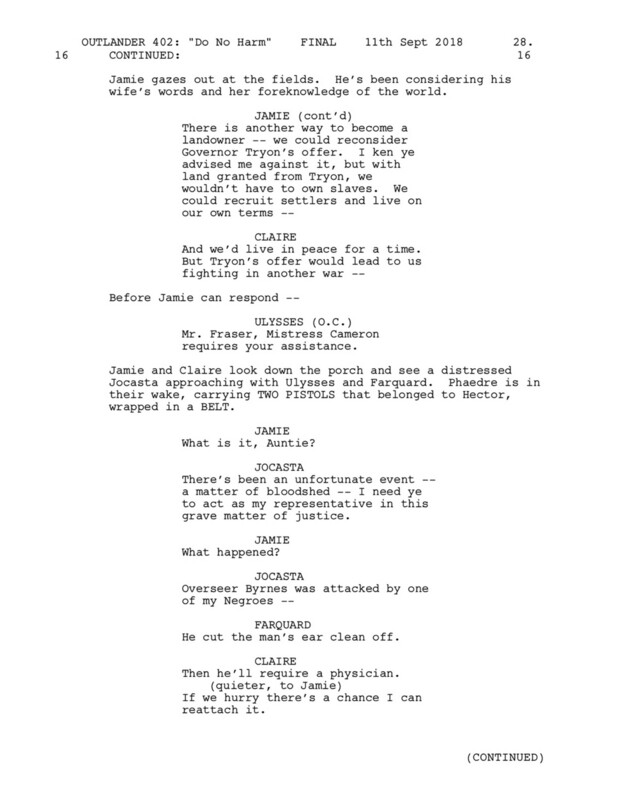 As a progressive man in the 18th century, Jamie is also disturbed by slavery, but he is torn as he tries to balance the emotions of reuniting with family. 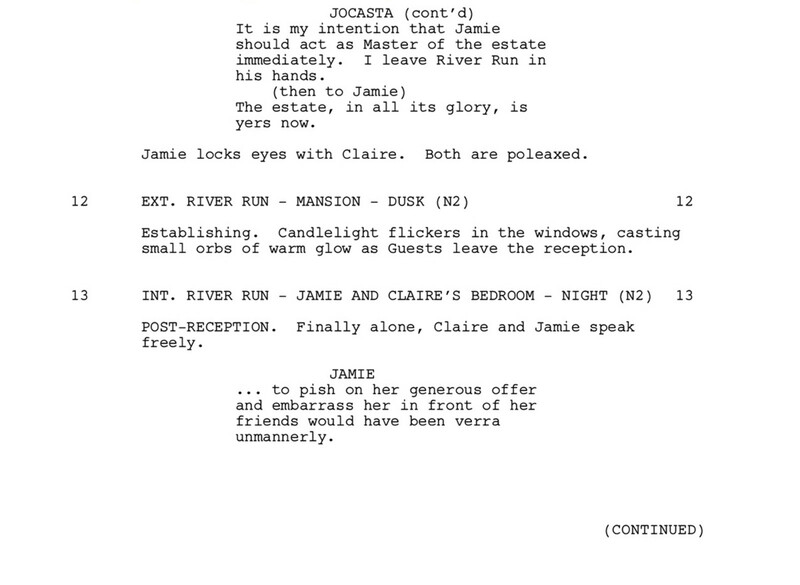 We had to walk the fine line of showing that Jamie shares Claire’s views, but knows Jocasta is a product of her time and someone who is literally blind to how wrong it is to own human beings. 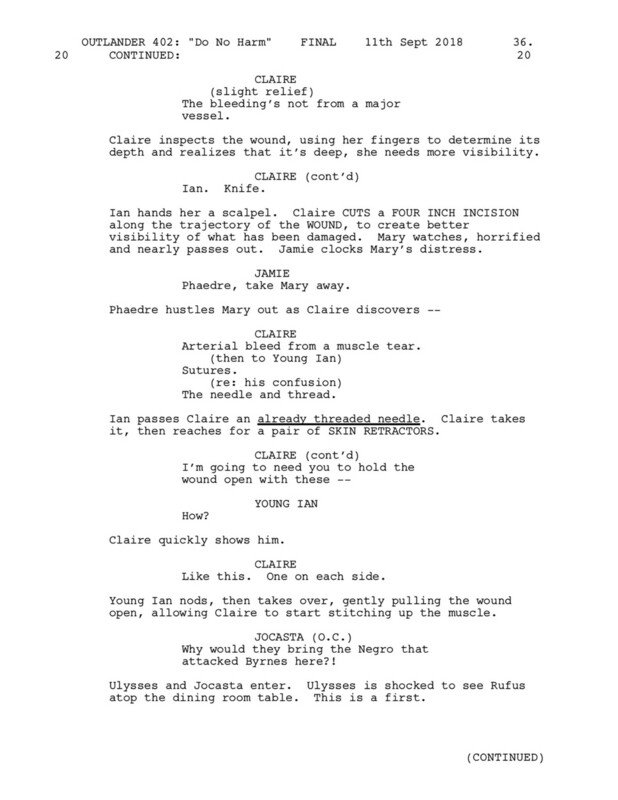 Claire encourages the slaves to use her first name (something the slaves are not used to), and they can tell right away that this woman is different. 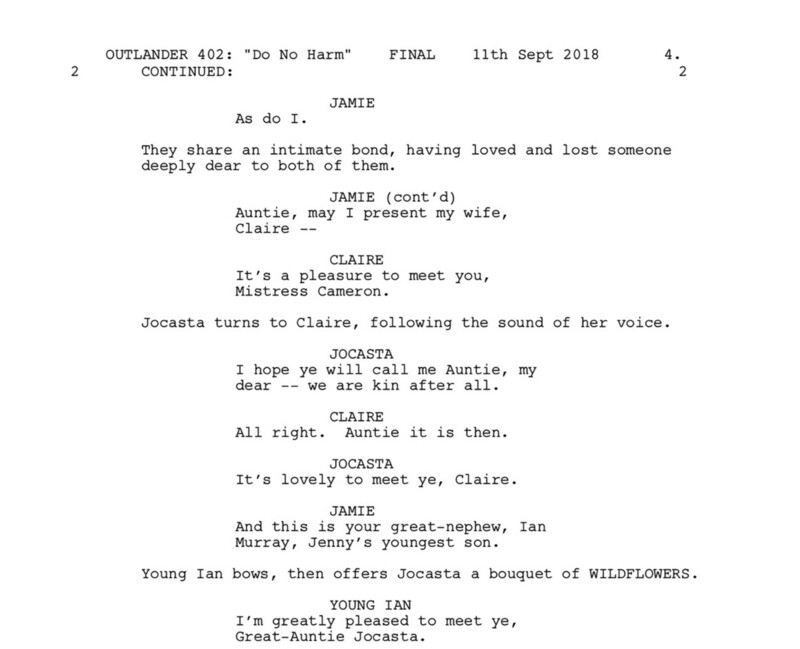 Jamie sees how upset Claire is at being surrounded by a lifestyle that she doesn’t believe in and reminds her that this will all change in the future. 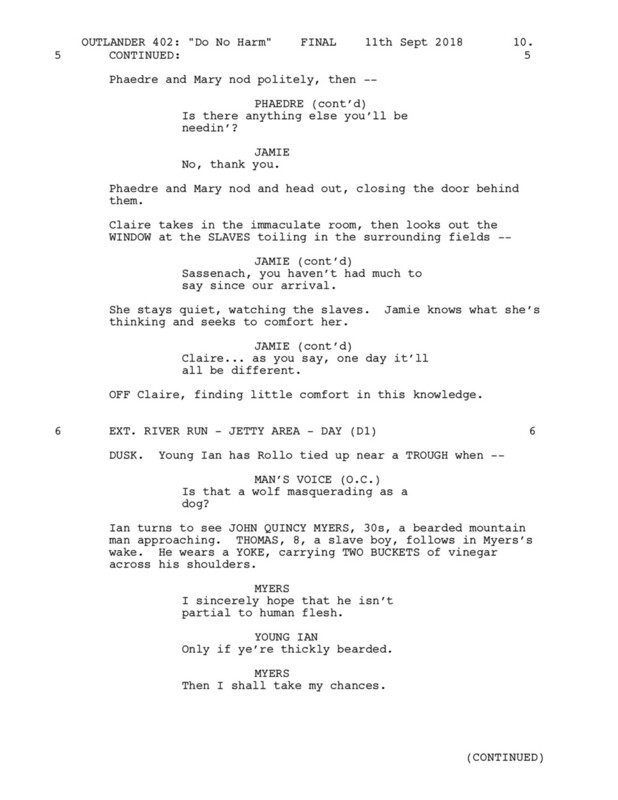 This episode was a very challenging one and sparked much discussion in the writer’s room. The writers ultimately felt strongly that we shouldn’t downplay or sugarcoat the reality of this era, even though we knew some of the images would be disturbing. Claire’s 20th century views put her at odds with her surroundings, but unfortunately she is not in a position to affect widespread change—the best she can do is speak her mind and take small steps in this issue that is so large that it sparked a civil war over the very topic. John Quincy Meyers is one of our favorite characters, and we were thrilled to get Kyle Rees, who we found to be a very charismatic man. The actor brought a zest for life that really brought John Quincy Meyers alive. Here’s where we kick off Young Ian’s fascination with the American Indians, something that will grow as the series progresses. Young Ian remarks that the American Indians aren’t much different than Highlanders. It’s his way of connecting the two cultures and feeling a kinship with the natives, but this is something Meyers warns him “might be best kept to himself,” as it can be dangerous to air radical opinions in this very narrow-minded, backcountry culture. 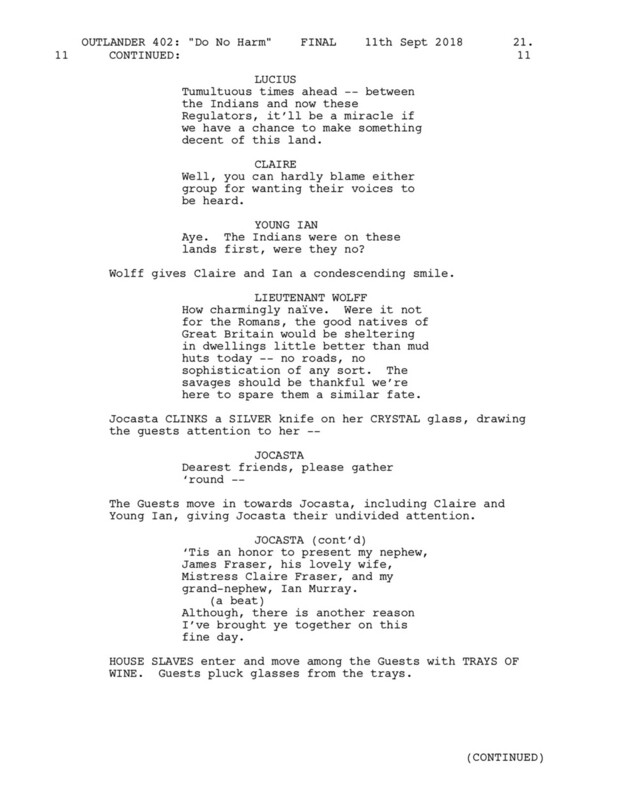 Claire and Jocasta’s differences start to cause conflict between host and visitor. We had a lot of discussion about how far to voice Jocasta’s attitudes about slavery. Naturally, we were concerned whether she would be unlikeable. 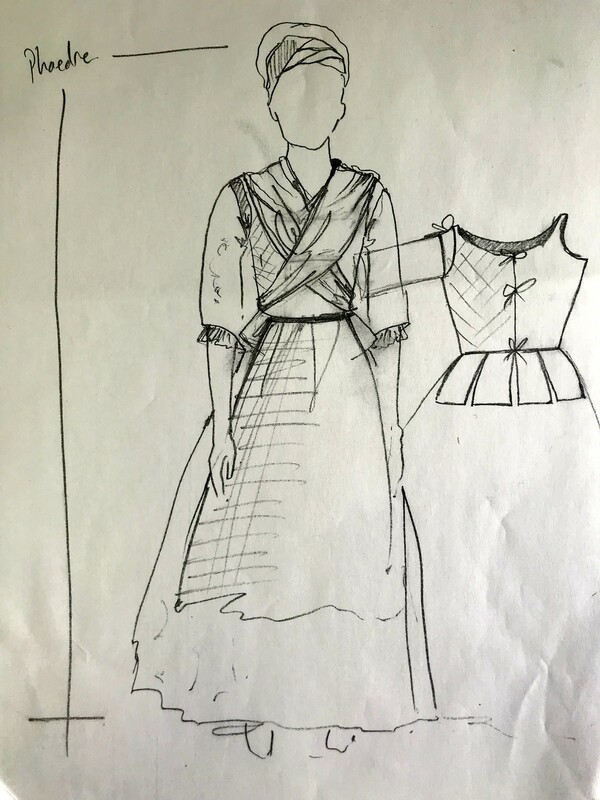 However, we thought it important to portray her as a realistic product of her time, and it highlighted the dramatic tension between these two spirited and opinionated women. Jocasta believes that because she takes good care of her slaves, they are “happy,” and is blind to the abominable nature of such sentiments. Lee Boardman, the actor who portrays Lieutenant Wolff, was fantastic and did a great job embodying the arrogance of the character. 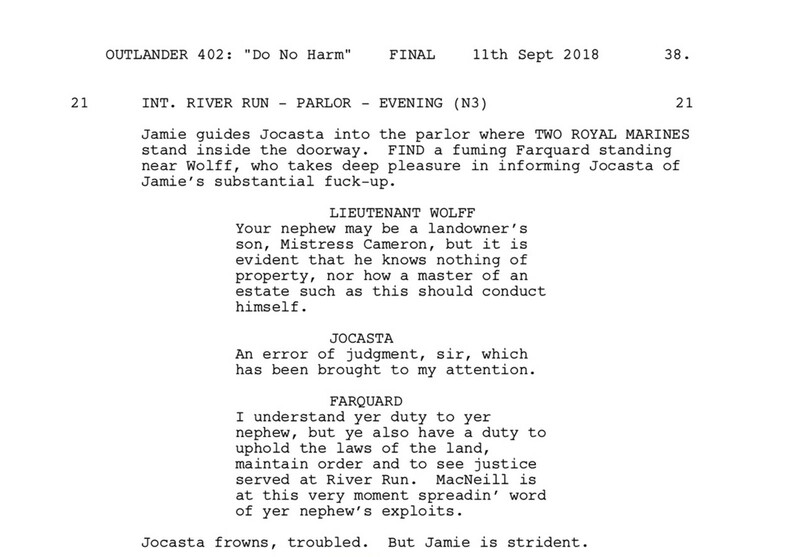 This scene where he bristles at the arrival of Jocasta’s nephew and sees Jamie as a formidable opponent at River Run is a tension that we wanted to set-up. 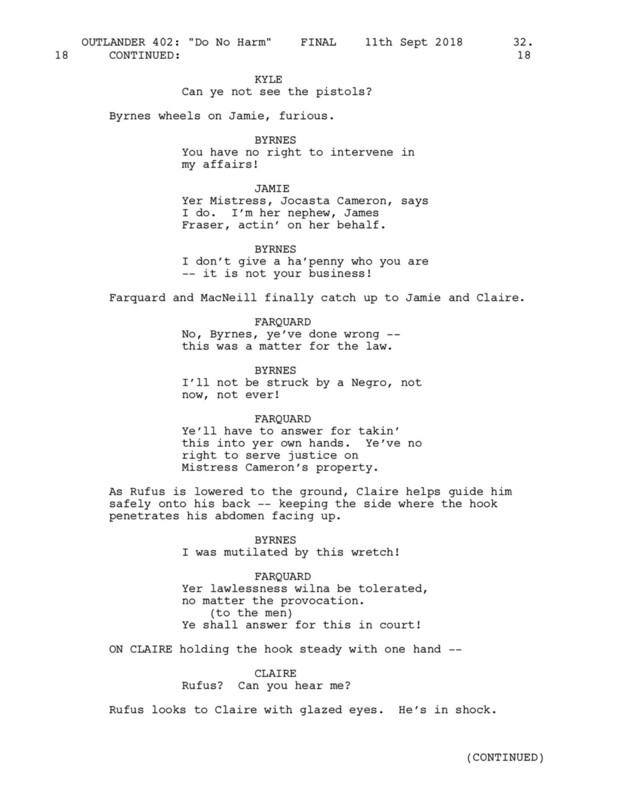 Claire and Jocasta continue to spar with each other. It’s easy to write overt arguments, but a challenge to portray a scene where neither is at liberty to blurt any of their overt feelings and must converse with subtle jabs at each other, constrained by the decorum of the time. Natalie Simpson, who plays Phaedre, was a gem of a find. The actress brought such a depth to this role as Jocasta’s personal house servant. 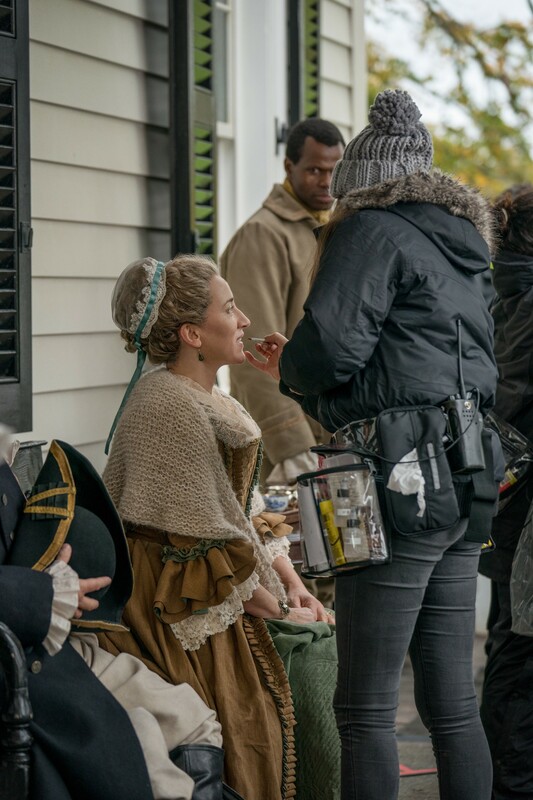 Here, Claire fights to hold her tongue for Jamie’s sake. 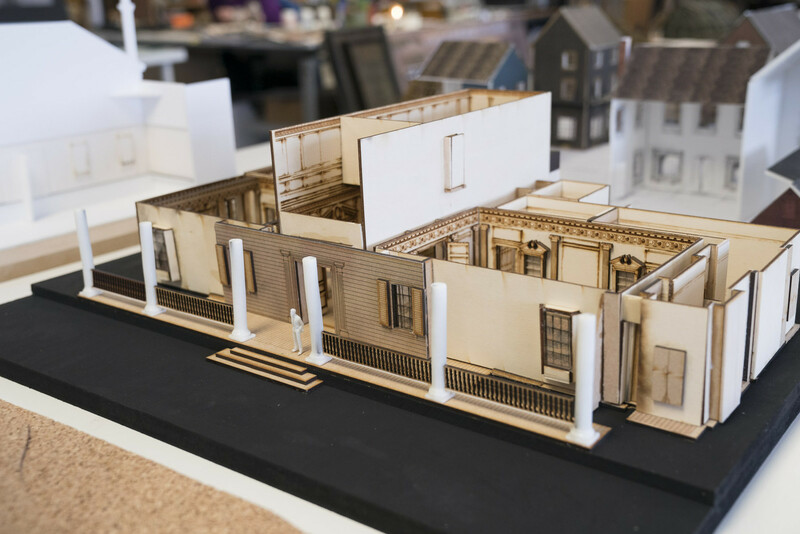 She wants to get along with her 18th century family, but it’s becoming increasingly difficult. 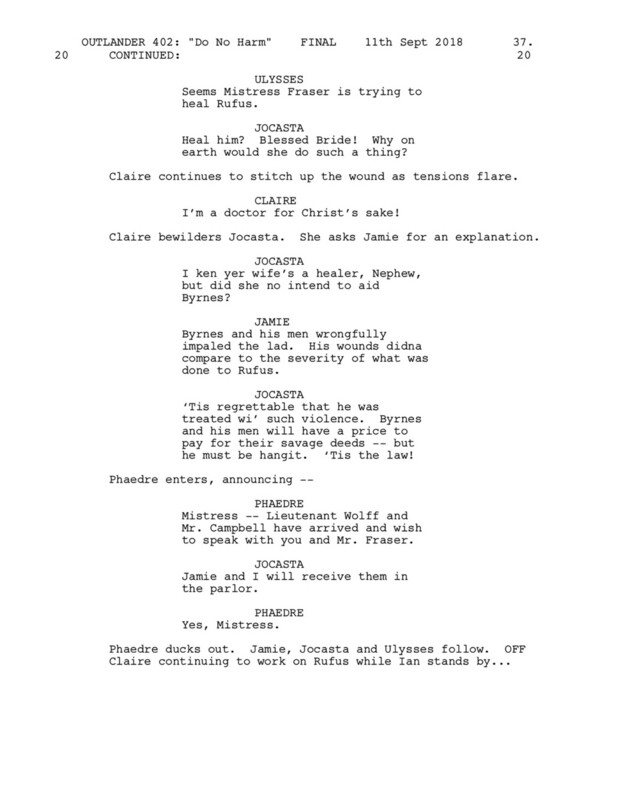 However Claire would not be Claire if she didn’t speak her mind, and finally challenges their way of life by admitting, “I don’t believe in keeping people as property.” The twist here is that Jocasta actually admires Claire and finds her lively—Jocasta can see why Jamie is drawn to her. 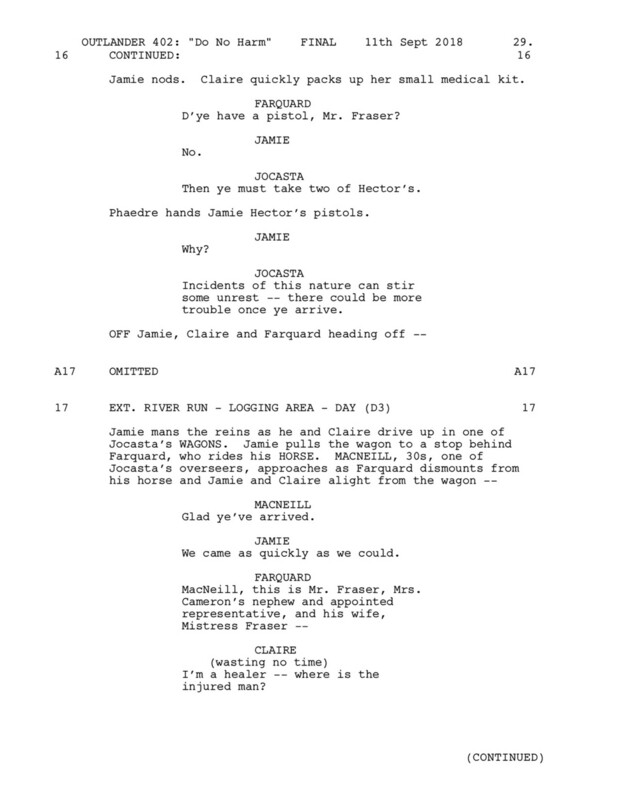 In the writers’ room, we talked a lot about how we must remember that Jocasta is a MacKenzie—for all her manners and refinery, she’s got MacKenzie blood in her veins and a great deal in common with her brother Dougal, a master manipulator. 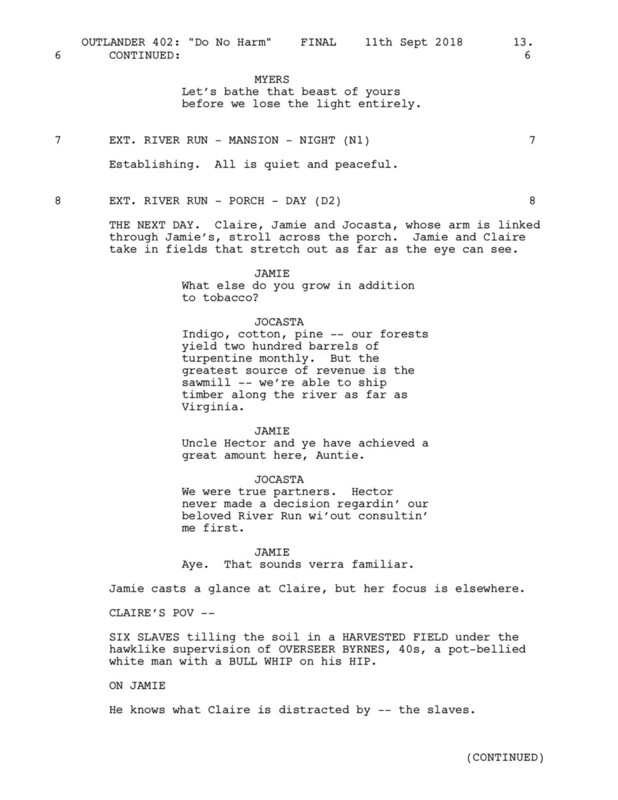 We see Jocasta’s manipulation when she surprises Jamie by announcing him as heir to River Run. On the surface, it’s a gracious and generous act, yet serves Jocasta’s own agenda and puts her nephew on the spot so that he can’t refuse. 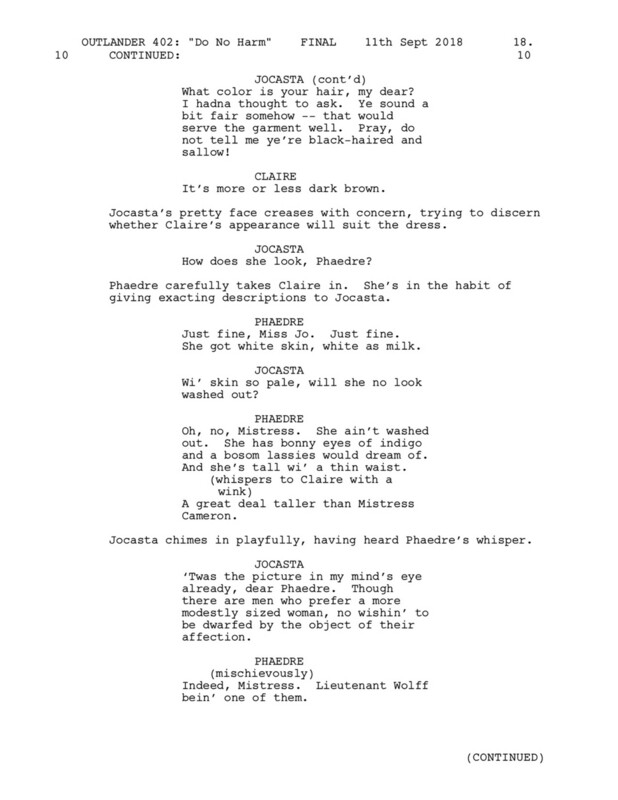 In the book version, Jamie contemplates Jocasta’s offer for many weeks. 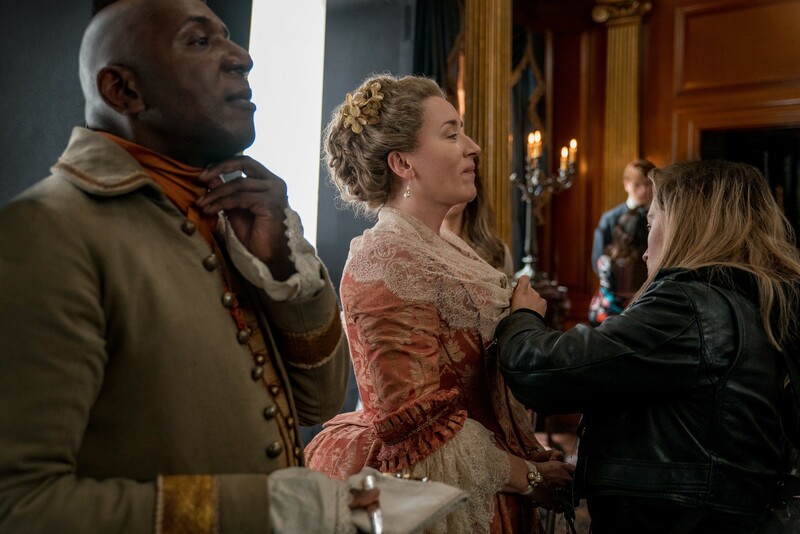 Claire says she’ll support whatever decision Jamie makes because she knows he’ll do the right thing, but we felt that for the show, it was important for Claire to not equivocate. We chose her to say outright, “We can’t own slaves.” Period. 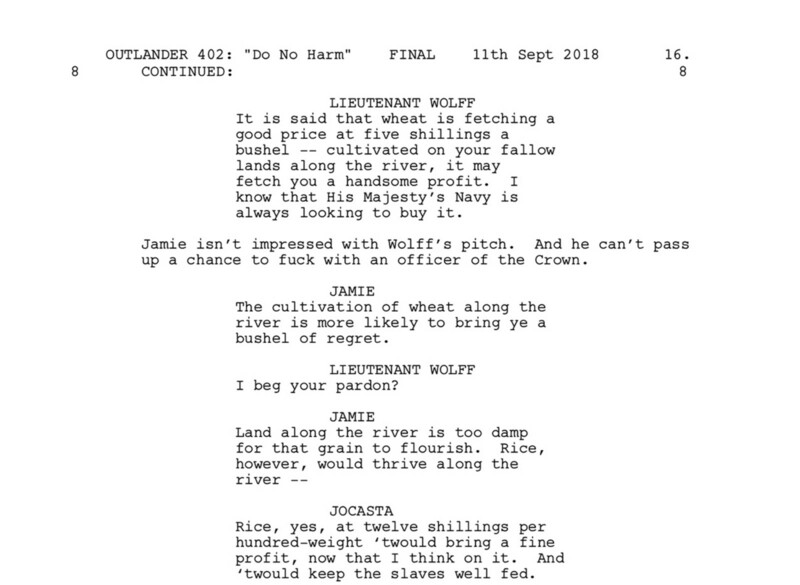 It was important that this scene not be an argument, as Jamie feels the same as Claire—he has no desire to own people—but Jamie tries to figure out a way that, by taking charge of River Run, he can to help the slaves. 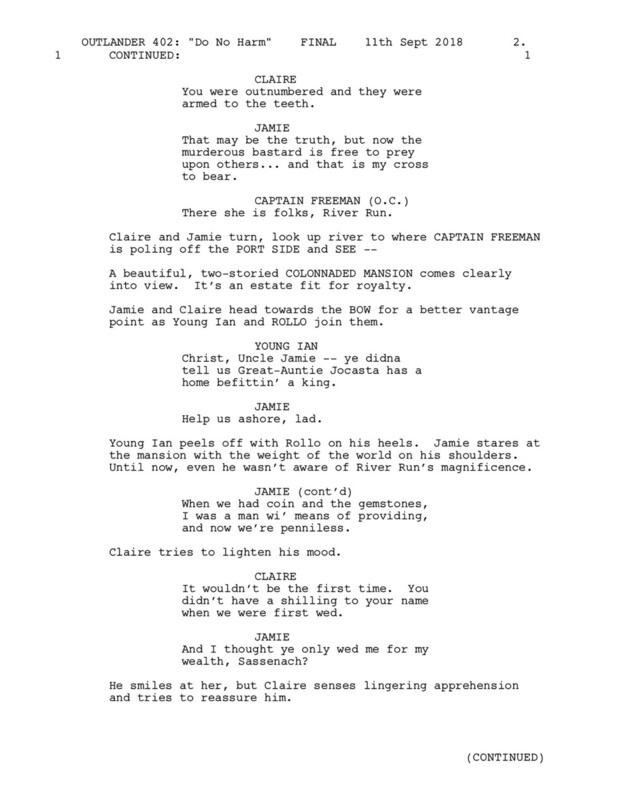 Jamie is being idealistic in this scene and tries to convince Claire that although they can’t change everything in this new world, if she can change just this one plantation, it can be a “spark that lights the fuse.” This idea of “being the spark” was central to this episode, and the writers felt strongly that it was the best way to show how our characters would embrace finding themselves in this massive dilemma. 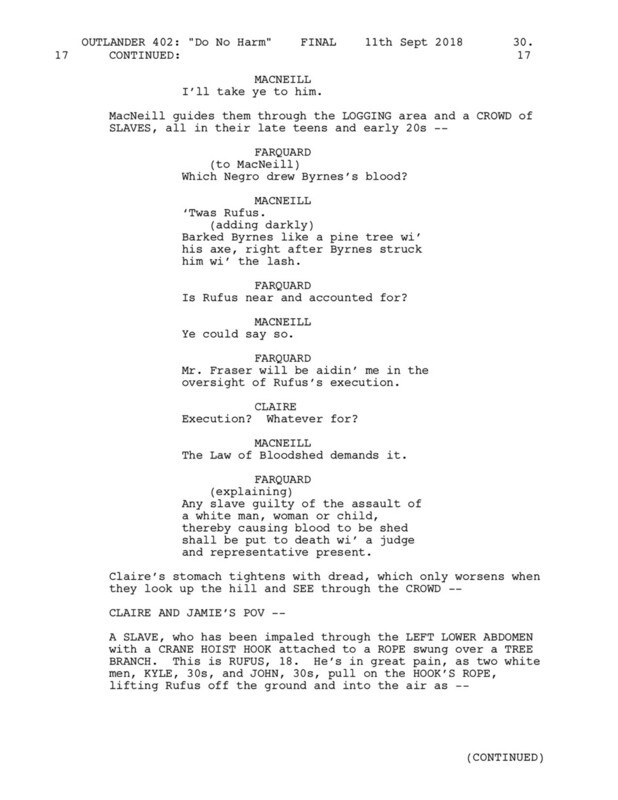 This was a tricky scene to write, but an interesting and explosive one. We had Jamie appear both grateful for this gift, yet try to turn it towards his progressive ideas by proposing huge changes, changes that are met with disbelief and outrage by Farquard Campbell. To suggest freeing slaves at this time was unthinkable, and though we established in Episode 401 that Eutroclus, the water man who worked for the river boat captain, was granted freedom for saving the Captain’s life, the idea of arranging the freedom of 150 slaves was impossible. 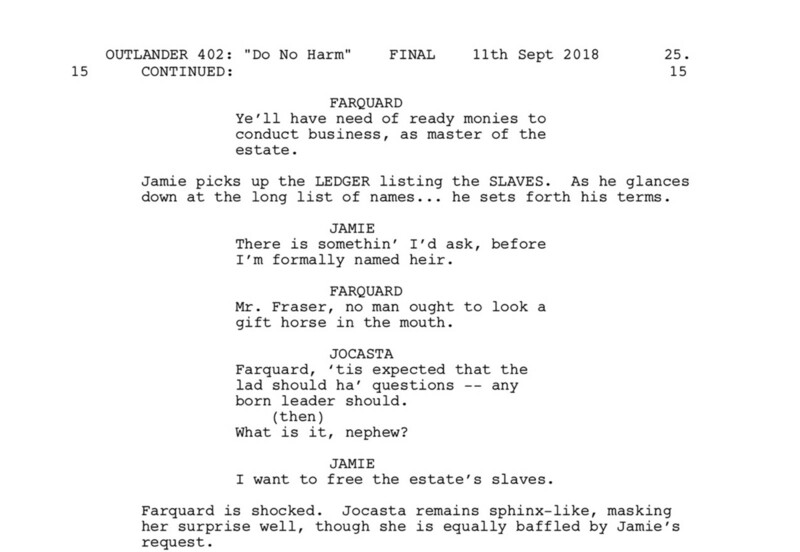 Farquard’s last speech to Jamie was important because it foreshadows the trouble to come, as Farquard tells Jamie that it’s not just that Jamie has a different opinion, but that his opinions are dangerous and could get him killed. 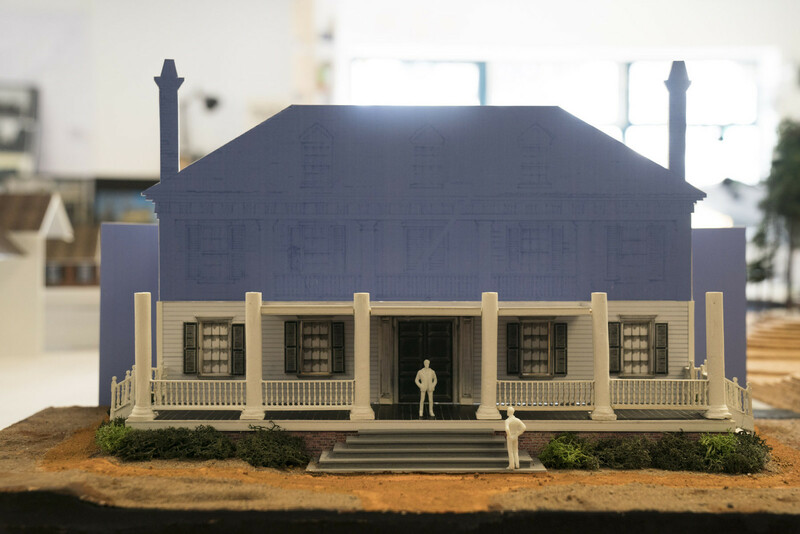 The changes Jamie wants to make will have reverberations in the community, and the neighboring plantation owners won’t stand for their social structure to be toppled by an outsider. Jocasta is alarmed by Jamie’s forward-thinking ideas. 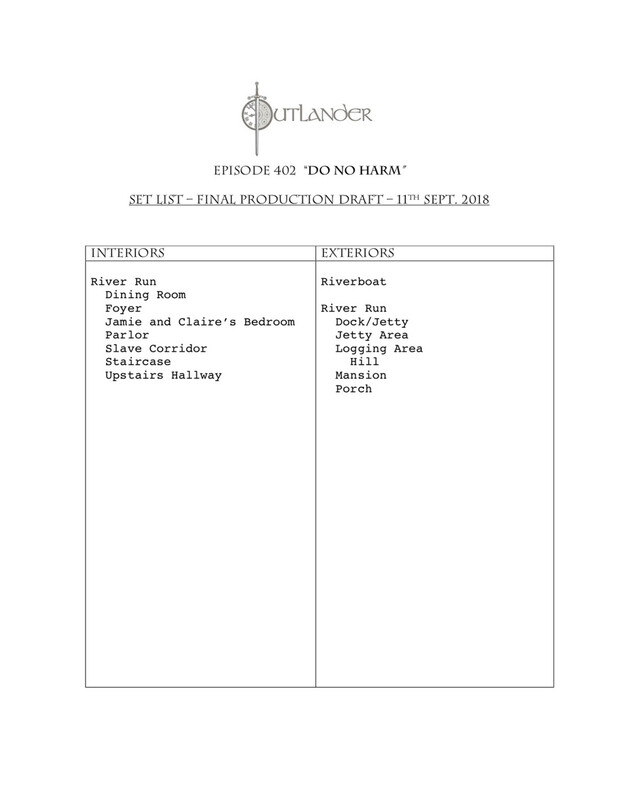 However, she loves her nephew and seeks to play peacemaker by encouraging her lawyer to entertain some of Jamie’s proposals, but Jocasta knows in her heart that none of this will fly and can see her plan starting to crumble. In the book, Jamie never attempts to free the slaves, but we felt that if he were to consider this offer, it should be on his terms. 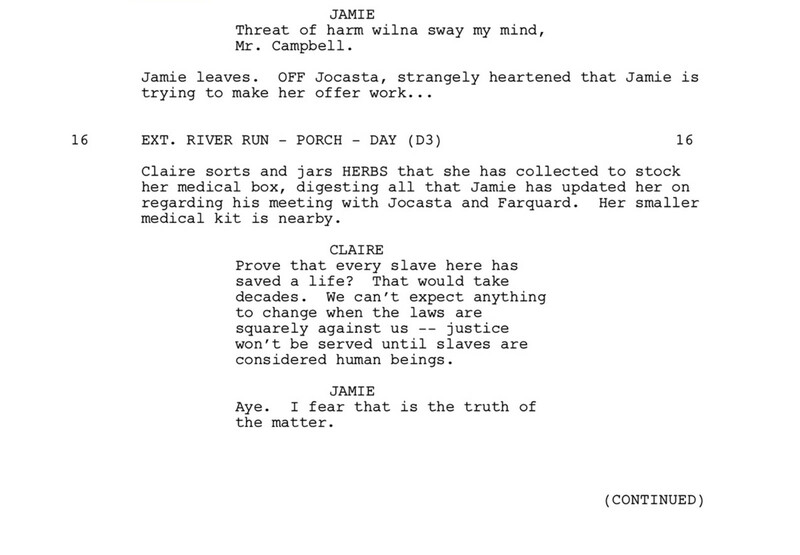 Claire and Jamie now come up against the realization of just how dangerous and volatile this situation is. 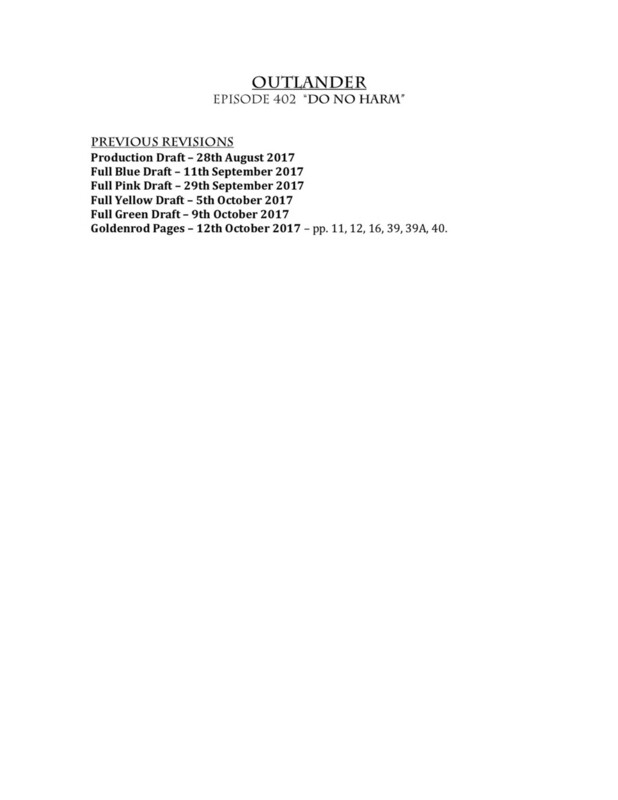 In the book, the incident with Rufus and the Law of Bloodshed happens before the party where Jocasta names Jamie heir. We switched the order so that there was an escalation which would demonstrate why Jamie’s ideas, sadly, would never be accepted. Jerome Holder as Rufus did a phenomenal job with a difficult role, and gave a haunting and heartbreaking performance. 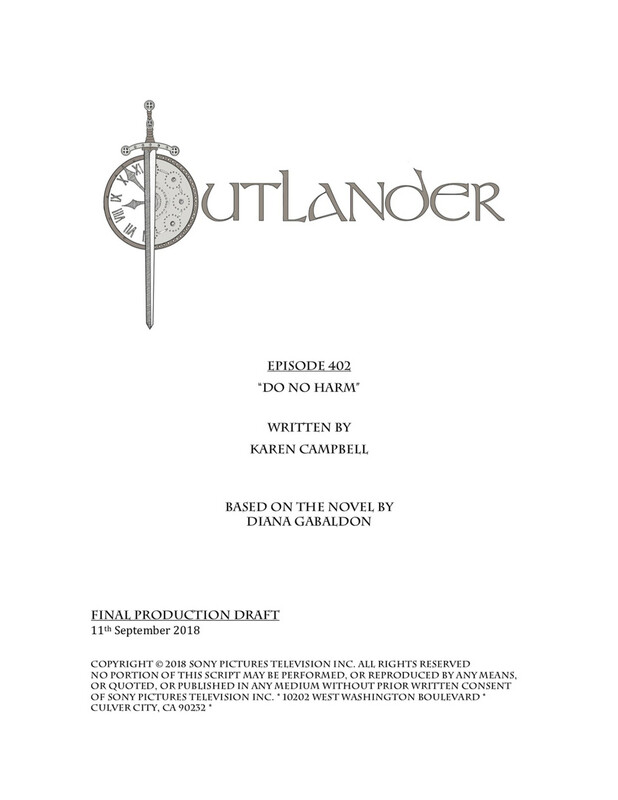 In the book, Rufus is removed from the hook and Claire and Jamie realize very quickly that the mob will kill him no matter what they do to save him, so Claire chooses to euthanize him at the sawmill. 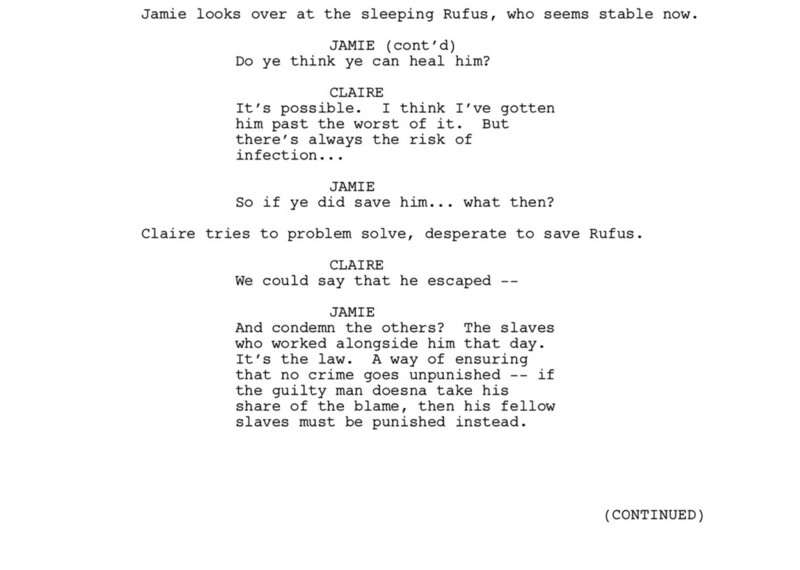 The biggest change we made was having Claire and Jamie bring Rufus back to the house in an attempt to save him. 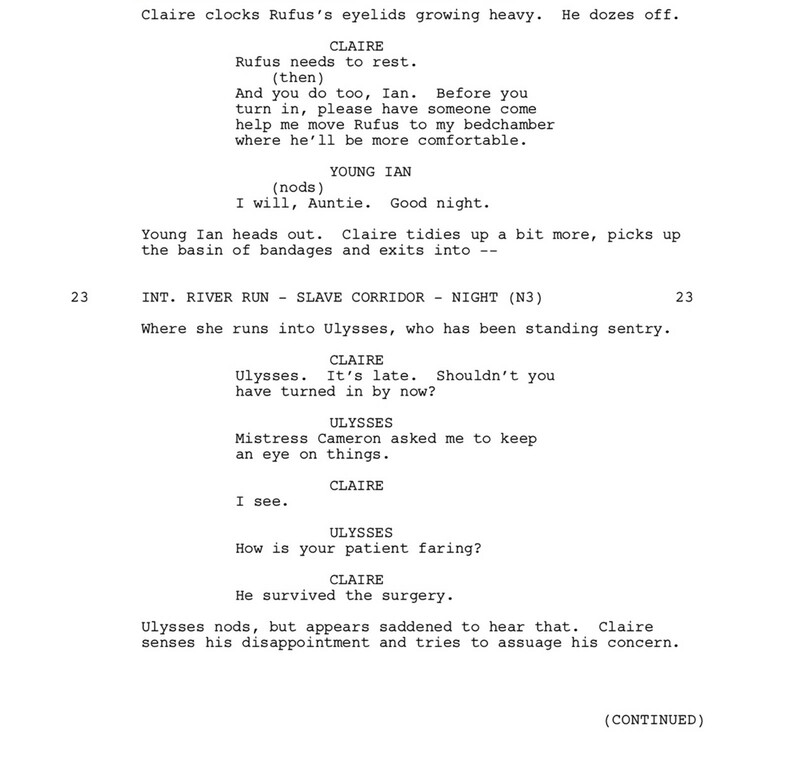 We wanted to play out the drama and extend Claire’s efforts to heal Rufus. 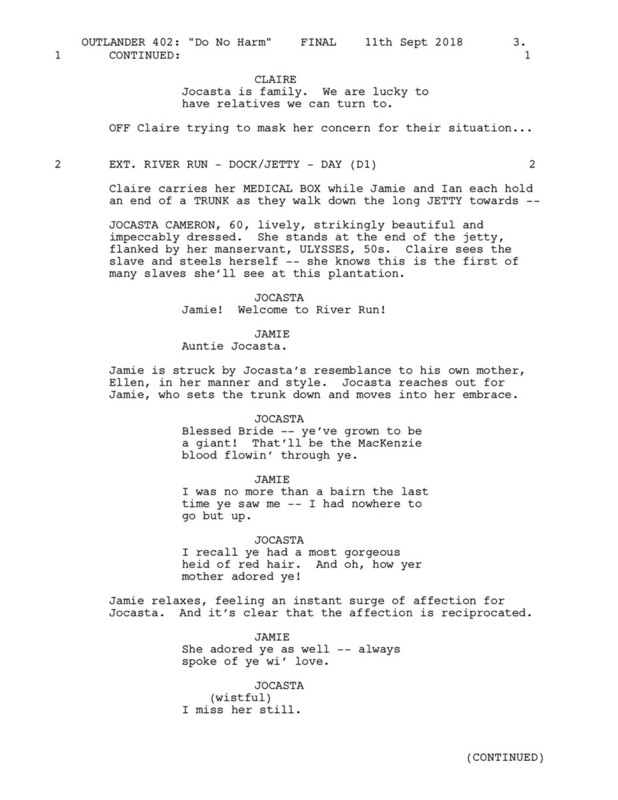 The stakes are raised as Claire puts Jocasta’s reputation, and the safety of River Run, at risk as the enraged community is determined to have their own brand of justice and not let these newcomers interfere with their way of life. 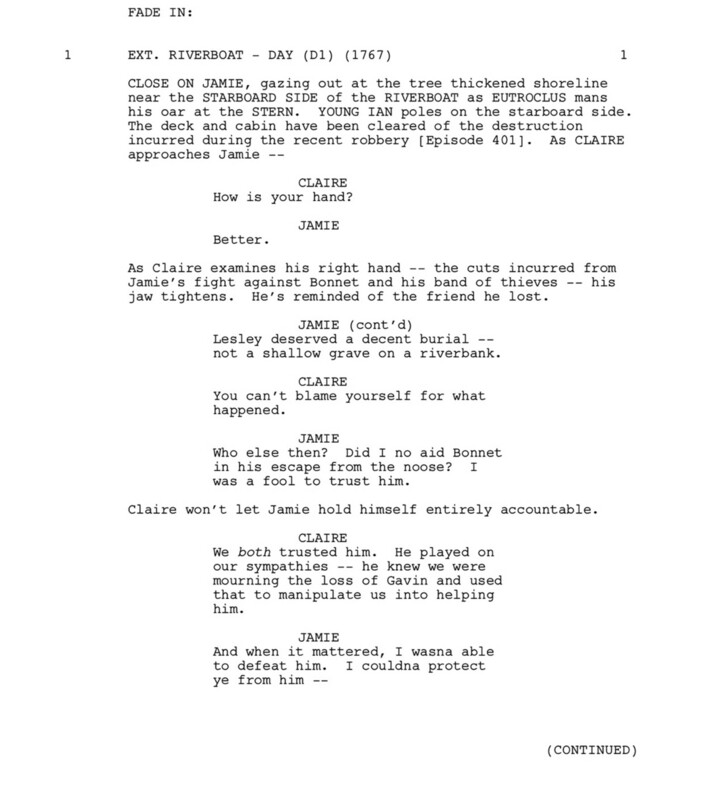 The idea was to use Lieutenant Wolff and Farquard Campbell to enlighten Jamie that by going against the laws of the land, he’s put his aunt in danger. 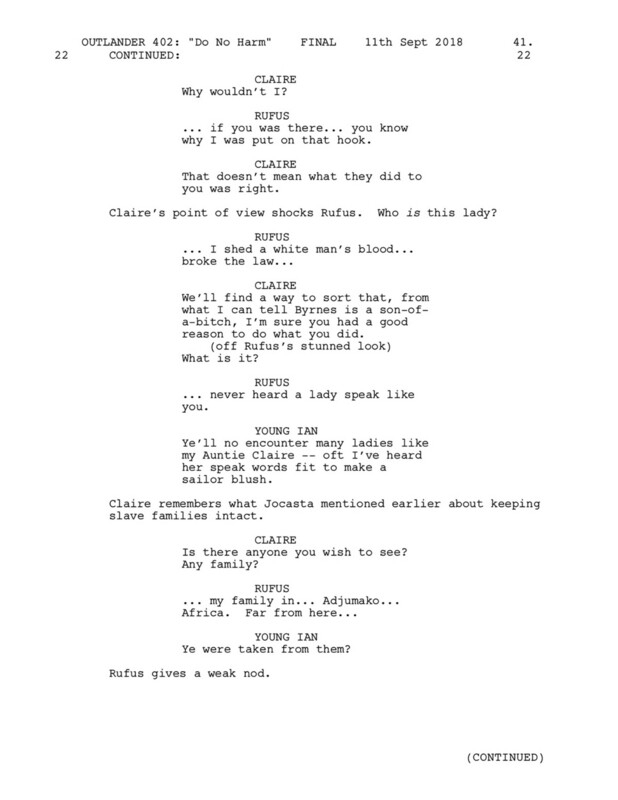 It was important that Claire and the audience know something personal about Rufus—that he has a family he loves and was taken away from in Africa. 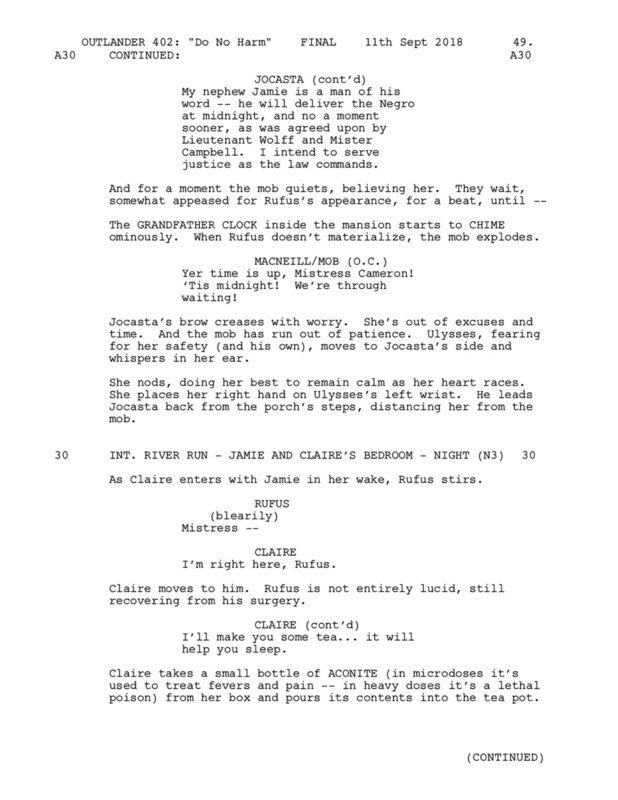 We had him tell Claire about his sister, which she invokes to ease his pain later in the story. This was a controversial scene, but we thought it was interesting and important to show the point of view of another slave. 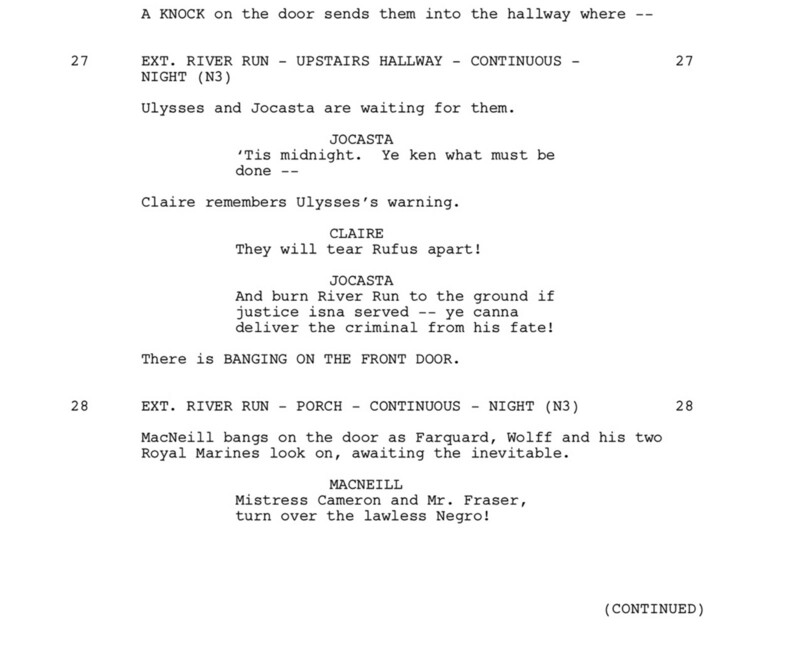 Although Ulysses appreciates that Claire is trying to help Rufus, he also gives her a cold dose of reality—that even if she saves Rufus’s life, she is only exposing him and the other slaves to more suffering at the hands of the hostile plantation owners. Jamie faces the difficult task of telling Claire that there’s no way Rufus will be allowed to live. He references the fact that by saving Rufus, they may cause other slaves to be hurt and killed as a repercussion. The couple realizes what an impossible dilemma they’re in, and that there is no way out of this horrifying situation. We decided an effective way to ratchet up this tension was to put a literal clock on the proceedings, so we know they have until midnight. 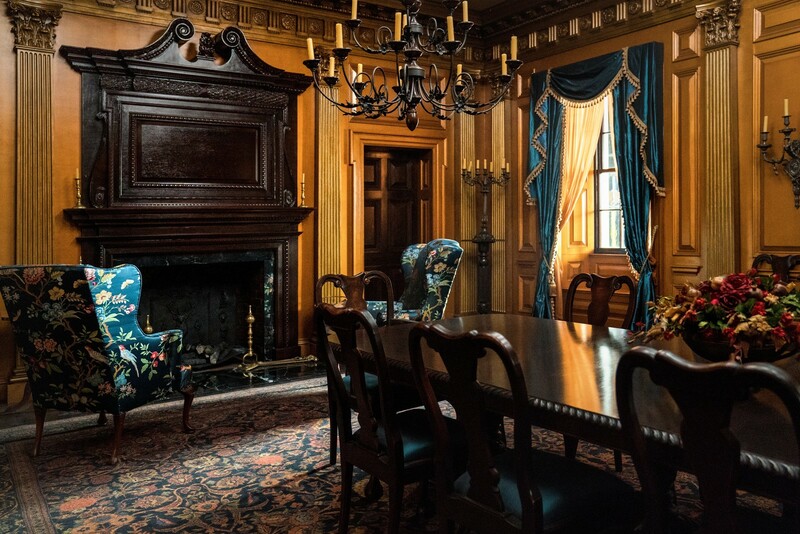 We use the grandfather clock as a motif all through the episode. 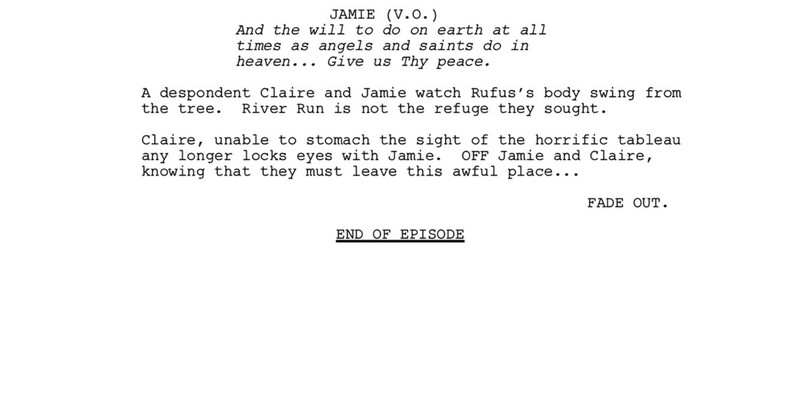 Jamie and Claire are literally under a deadline to return Rufus or risk River Run being burned to the ground. We added the angry mob to show the community’s intolerance, and to dramatize just how violently people react when their way of life is threatened. 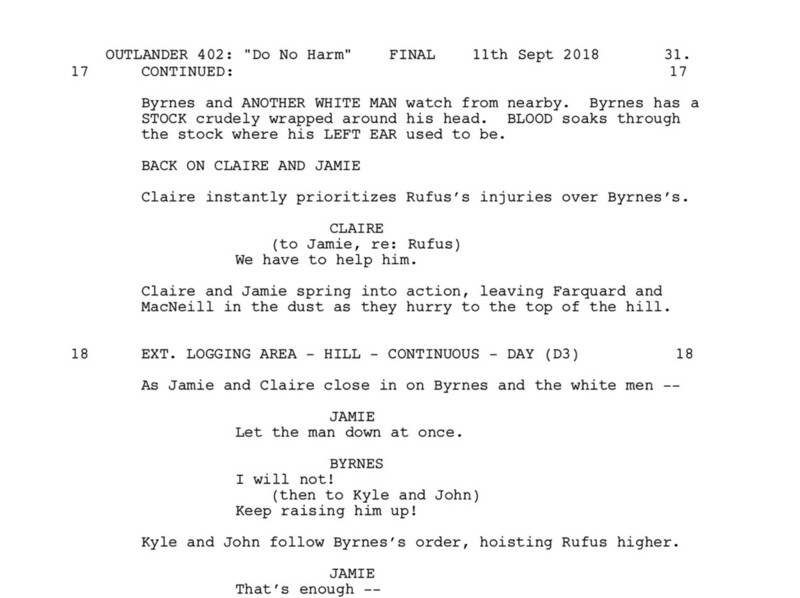 Jamie remembers how Claire helped Colum experience a peaceful death through a lethal tea, but we wanted Jamie to afford Claire her own choice by saying that he’ll defend her no matter what she chooses. 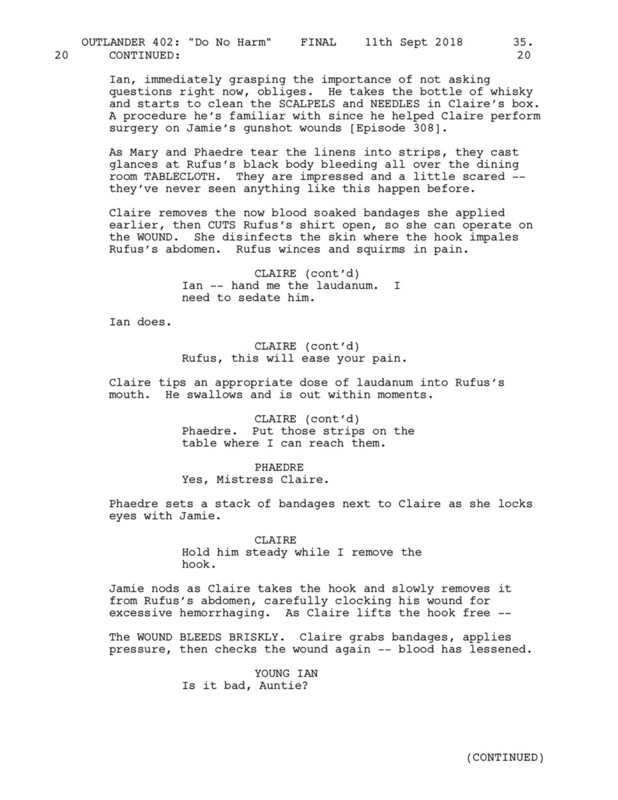 He recognizes Claire’s oath is to “do no harm,” but, seeing no way out of this, he gently encourages her toward the option which that will end Rufus’ suffering with as much mercy possible. 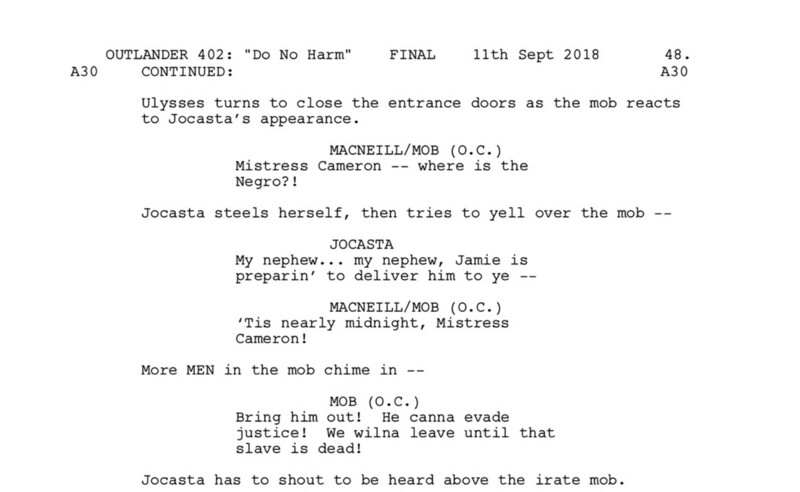 This scene was added late in the script, during production, when we realized that we needed to escalate the tension and have something to cut away to, so as Claire and Jamie tend Rufus, Jocasta holds off the mob. 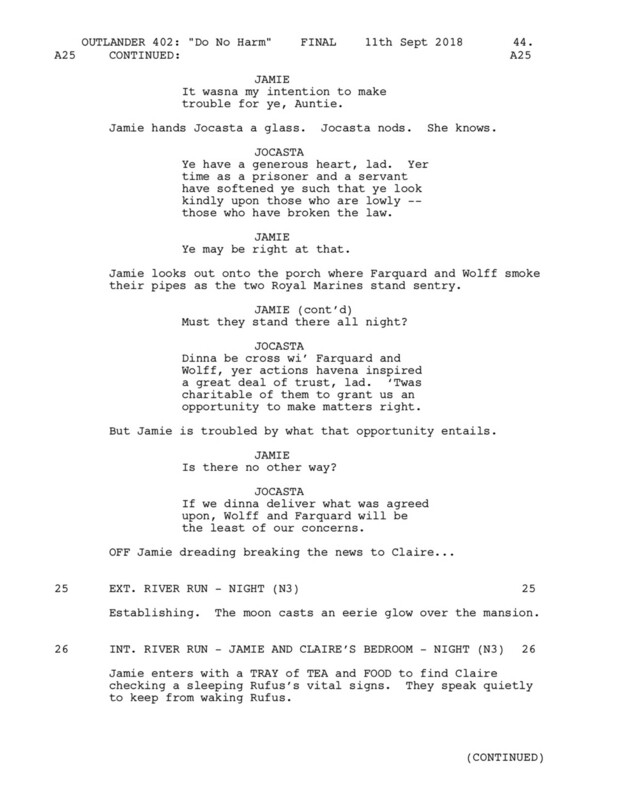 This is the most heartbreaking scene in the script. 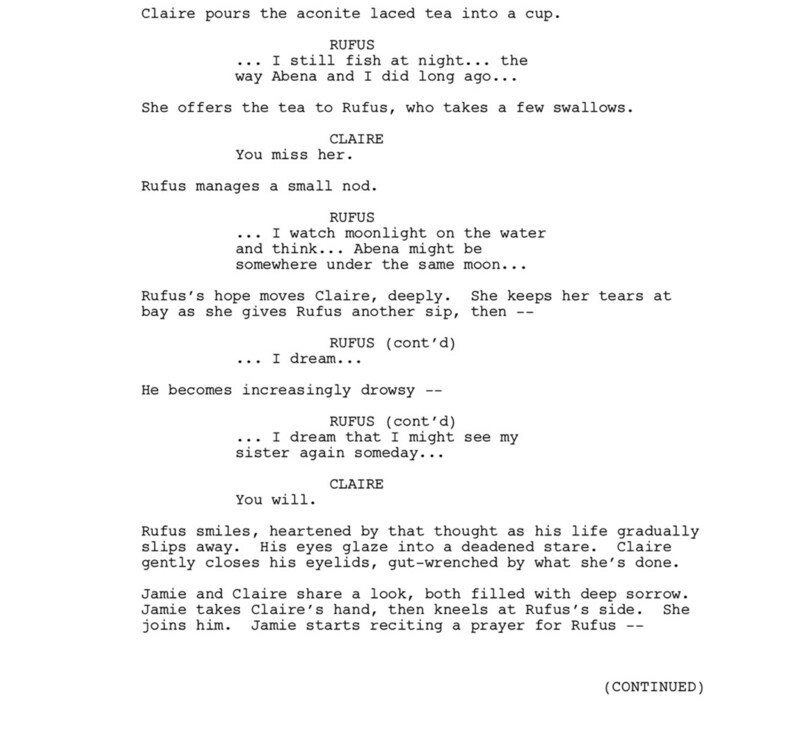 We have Claire use the story Rufus told about his sister in order to guide him to his peaceful departure from his life. Claire is devastated at having to do something so against the oath she took to save patients, but this is the only choice she has, and one that will haunt her. 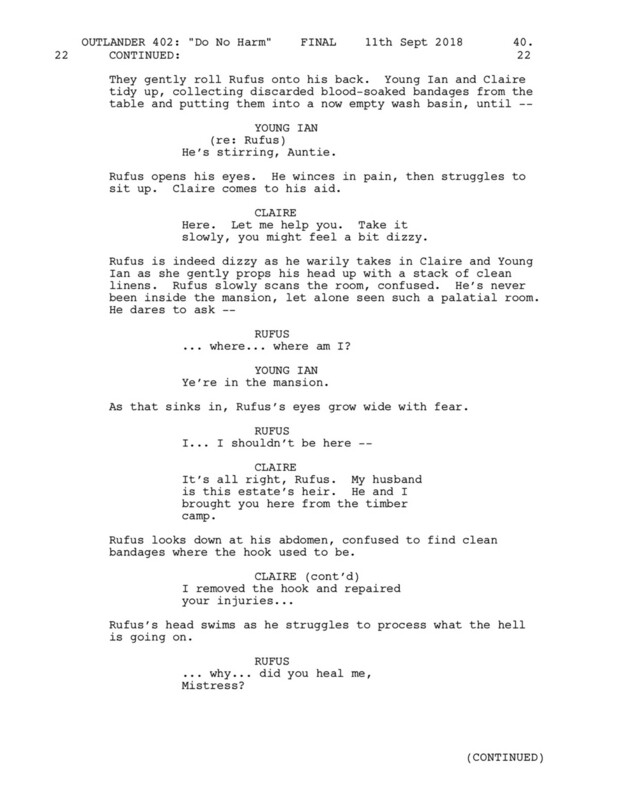 Again, these were devastating scenes to write and film, but crucial to show the reality of the mob getting their way, to see the brutality of the hanging and to realize what Claire has saved Rufus from. 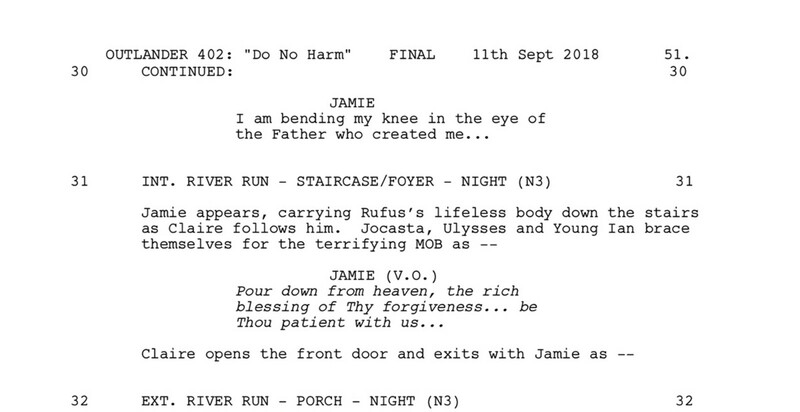 She and Jamie were unable to spare Rufus’s life and must turn over his body, but Jamie prays for his soul as the mob has their way. 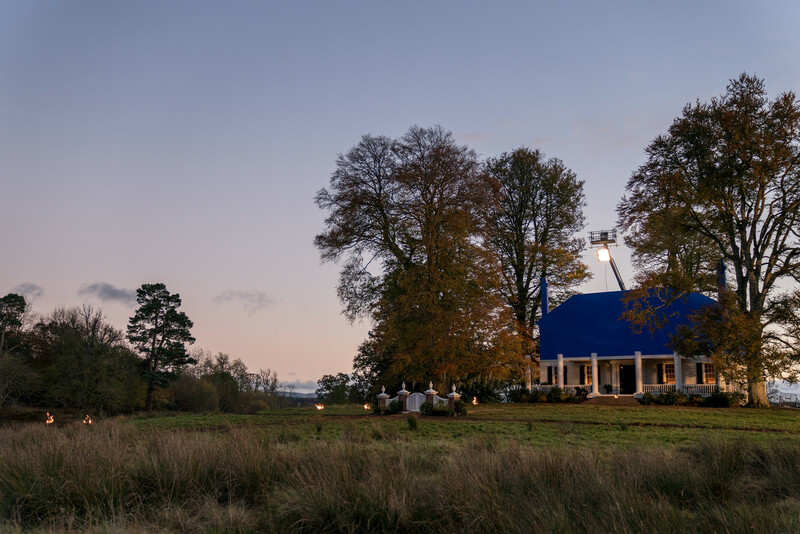 The set constitutes about 12,000 square feet as an interior set and there is an exterior set in parkland, in Northern Scotland. 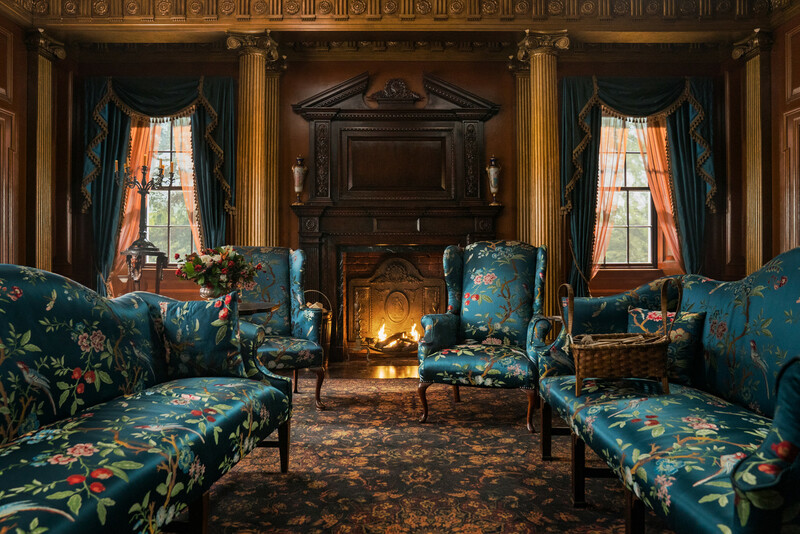 As the show is filmed in blocks of two episodes, each with different directors, Gary Steele designs with as many options for camera as possible—vistas through double doorways with fireplaces in the parlor and the dining room, for example. 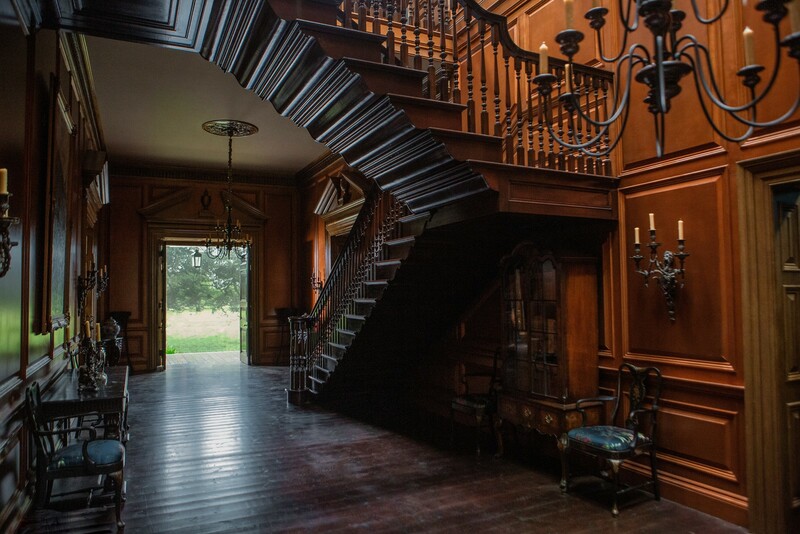 The huge sweeping staircase is a piece of art in itself.